This production opened on August 2, 2017 and closed on August 6, 2017. All James Henry Trotter wants are his parents back. After they perish in a rhinoceros run-over, James is sent to live with the horrid, cruel Aunt Sponge and Aunt Spiker. James stares out of his window often, barely able to see the sea, wishing and hoping for happiness…until, one magical day he is given a way out! James begins a most magical and magnificent journey; alongside the best friends one could ever want. Swamp Meadow Summer Children’s Theatre can’t wait to take you along the adventure this summer! Our talented cast and crew bring this well-loved, classic tale to life with a fresh twist and visual appeal. 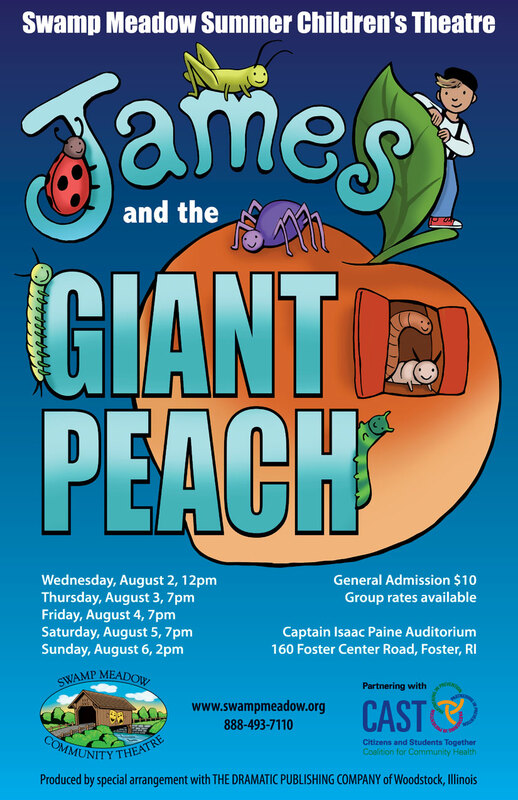 James and the Giant Peach opens Wednesday, August 2nd at 12:00 pm, then runs Thursday, August 3rd – Saturday, August 5th at 7:00 pm; with the last performance on Sunday, August 6th at 2:00 pm. Swamp Meadow Community Theatre performs at Captain Isaac Paine School, 160 Foster Center Rd, in Foster, RI. Tickets are $10, available through Brown Paper Tickets at www.swampmeadow.org. Swamp Meadow Community Theatre has boxes available at each performance for anyone who is able and willing to donate canned food/non-perishables to those in need.